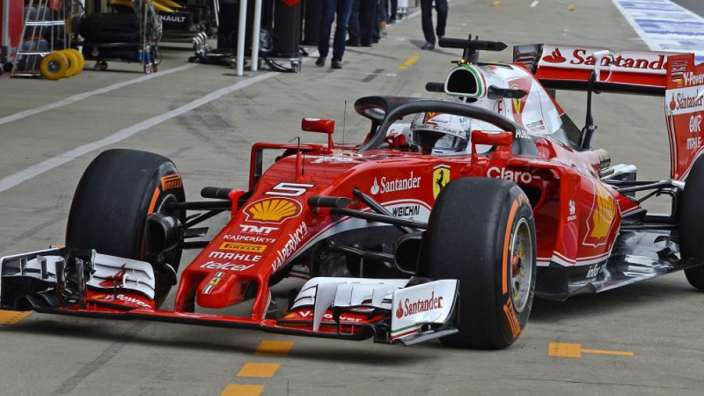 Sebastian Vettel and Kimi Raikkonen blew the other drivers away in qualifying for the Chinese Grand Prix on Saturday as the German took pole ahead of his team-mate, and he believes a large portion of the success is down to the "unbelievable" Scuderia car. The four-time Formula One world champion has made a blistering start to the new campaign and won the opening GP in Australia before following that up with a victory in Bahrain. Both he and Raikkonen set lap records on the Shanghai International Circuit, although Vettel's was better, and he has hailed his Ferrari car as the difference-maker. "The car was unbelievable and it just got better," said Vettel shortly after confirming pole. "I was very happy with the settings I had from the beginning. "We are surprised [by the gap to Mercedes]. The first three races have been a bit different, the tracks are quite different to each other but to have that much of a gap I think is a surprise." Ferrari will enjoy their first pole in the Chinese GP for 14 years, and will break a run of six straight poles for Mercedes, and Vettel was delighted to break their streak. "It has been a Mercedes track for the last six years so it's good to break their run," Vettel added. "It's good news. It shows that we have some potential in the car and then if we can unleash it and it's coming together, it feels good. "If you find the sweet spot, where ever you are in the field it helps you to enhance your performance. That's probably what happened today, I don't know if the others struggled with their tyres today but for us it was pretty straight-forward." Vettel and Raikkonen will start in P1 and P2, with Valtteri Bottas and Lewis Hamilton of Mercedes in behind in P3 and P4.